Polymer nanocomposites are one of the hottest topics in plastic technology today. Nanocomposites are materials that contain nanoscale fibers held in a continuous phase called a matrix or resin. Nanoparticles are those that are between 1 and 100 nanometers in size. (A nanometer is one billionth of a meter). Thus plastic nanocomposites are made up of nanoparticles embedded in plastic resin and are a near molecular blend of resin molecules and nanoscale particles. Nanocomposites are not new phenomenon in nature. Much of the inorganic part of soil is made up of nano-materials, giving it the ability to filter out particles at the molecular or nano-level. Our bones are examples of a nanocomposite as are parts of mollusk shells. For example, mother of pearl (nacre) is made up of alternating layers of inorganic aragonite (CaCO3) and an organic biopolymer. Nacre is twice as hard and 1000 times as tough as its constituent materials. Currently, nanoclays, also called nanominerals, are the most commonly used commercial additive for the preparation of plastic nanocomposites. Nanoclays account for almost 80% of the total volume produced worldwide. The most widely used nanoclay is montmorillonite, which is a very soft mineral that typically forms a clay of microscopic crystals. Also gaining in commercial use are carbon nanofibers and carbon nanotubes. 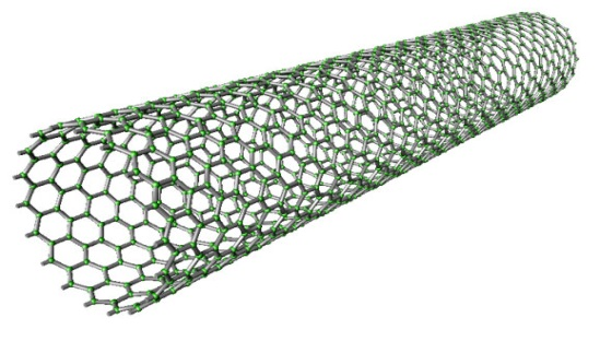 MWCNTs, or multi-walled carbon nanotubes, are used in the manufacture of semiconductors. Additionally, another group of nanoparticles growing in use is synthetic polyhedral oligomeric silsesquioxanes (POSS). POSS are made of silicon and oxygen atoms linked together in a cubic form, with silicon atoms occupying the corners. Nanofibers have been mixed with a variety of polymers including polyamides (nylons), polypropylene, polystyrene, epoxy resins, polyurethanes, polyimides, PET, and others to make useful polymer nanocomposites. The aspect ratio is the length/diameter of an object. Thus particles with a high aspect ratio are long and slender while those with a low aspect ratio are short and wide. High aspect ratio nanoparticles are referred to as (HARNS). The surface to volume ratio is the amount of surface area per unit volume of an object and is inversely proportional to size. Thus materials with a high surface area to volume ratio are those that are small in diameter or very porous. These react at much faster rates than monolithic materials because more surface area is available to react. A simple example is between coarse versus fine salt particles. Coarse salt will dissolve more slowly in water than fine salt grains that have a relatively high surface to volume ratio. The strength to weight ratio or specific strength is defined here as a material’s force per unit area at failure divided by its density. Nanocomposites have a higher strength to weight ratio than carbon fiber or glass fiber reinforced composites. The tensile strength of carbon fiber is 6,300 MPa with a specific strength of 2,457 kN x m/kg while that of carbon nanotubes is 23,000 MPa and a specific strength of 45,268 kN x m/kg. Nanocomposites typically contain 2-10% loadings on a weight basis, yet these composites yield property improvements that are equal to or better than traditional polymer composites containing 20-30% mineral or glass. Polymer nanocomposites are used in a variety of applications. As an example, let’s look at nanocomposite use in the anodes of lithium ion batteries. The anodes made of a silicon-carbon nanocomposite allow closer contact with the lithium electrolyte and thus faster charging and discharging of power. They are also used in windmill blades for their strength to weight ratio and in cars and aircraft to improve fuel efficiency. Are you using polymer nanocomposites in your applications? Tell me about it in the comments section below. Interested in learning more about reinforced plastics? 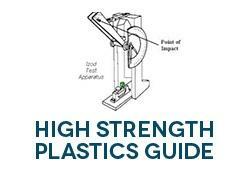 Download our free High Strength Plastic Guide.